Lewis is a producer and content director for WTJU and co-founder of Teej.fm. His primary responsibility is overseeing and assisting producers with taking a new idea and turning it into a sustainable podcast. Lewis is working on an ambitious audio drama podcast in partnership with UVA’s Drama department, which is expected to drop in April 2019. Chase has been a Teej.fm producer since its inception, and has also served as Co-Director and DJ at WXTJ 100.1 FM. Audrey has worked with WTJU in a variety of capacities, and currently also serves as the Rock Department Music Director. Nathan Moore builds platforms for other people to use -- mostly media platforms, but sometimes literal platforms. He is the general manager at WTJU 91.1 FM at UVA. 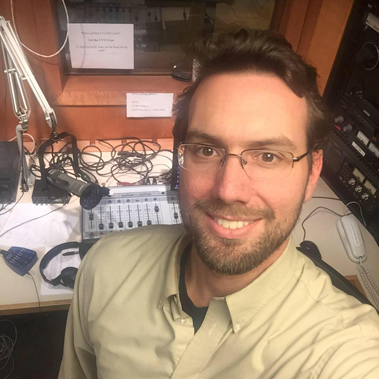 In 2013, he launched UVA's student-run station WXTJ 100.1 FM, WTJU's sister station, where he serves as staff adviser. He is a co-founder of Teej.fm.